Welcome to The Simpsons Forever! The Simpsons, seasons 1 - 13 (1989 - 2002). A now forgotten art form, traditional hand painted cel animation was once used to bring our favorite family to life on television screens around the world. We have assembled an in-depth guide to help fans learn about original production cels from the show, explore episodes created with cels, find links to the best galleries for purchasing cels, and display cels owned by collectors. Own a Simpsons Cel? Register It Today! If you own a Simpsons production cel be sure to register it in our exclusive Simpsons Cel Database for FREE. 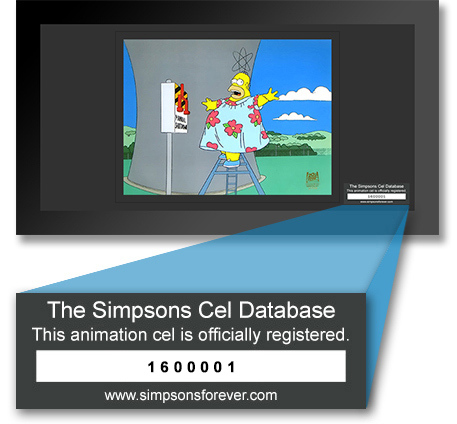 The Simpsons Cel Database is a way for enthusiasts to keep track of every authorized production cel that was ever officially released from each episode.